Unlike college graduates who can easily find work through online job marketplace sites, high school and vocational school graduates usually turn to newspapers’ classified advertisements and recruitment agencies to get hired. FindWork co-founders Allen Tan Chee Hoe and Kevin Williams encountered the problem first-hand when they tried looking for part-time skilled workers in Singapore. “Back then, (companies) would recruit through WhatsApp. Hirers would post about job openings in one group then the first one who replies will get the job,” said Williams in a press briefing in Manila on Thursday, August 30. After extensive research, Hoe and Williams learned it’s the same problem encountered by skilled and blue-collar workers in other countries such as the Philippines and Indonesia. That’s when they came up with FindWork, an online job marketplace solely dedicated to skilled laborers. 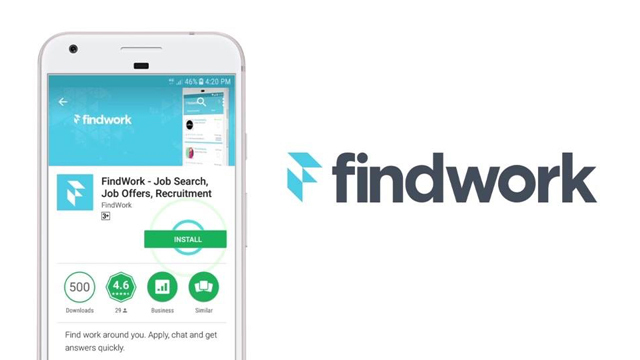 Soft-launched in May 2018, FindWork serves as a matchmaker for skilled workers and companies looking for service, construction and maintenance staff, among others. The mobile app, which is only available for Android users for now, allows applicants to be matched to a job posting based on his or her work experience, educational attainment, training and location. Blue-collar workers generally refer to employees engaged in fabrication, assembly and related activities, material handling, warehousing and shipping, maintenance and repair, janitorial and guard services, auxiliary production and other related services, according to the International Labor Organization (ILO). On the other hand, white-collar workers generally cover office, clerical, administrative, sales, professional and technical employees. 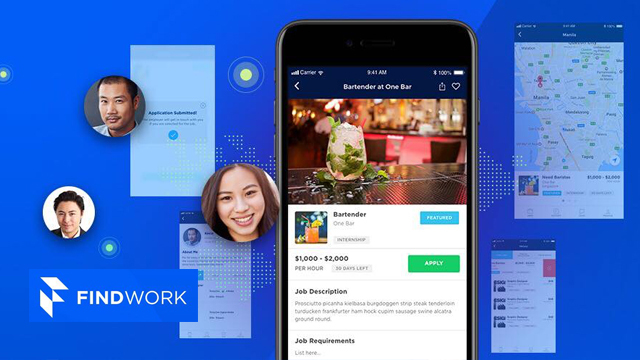 As for FindWork, most of its active job postings in the Philippines—currently at around a thousand—are from food and beverage establishments and construction firms. The platform has on-boarded 500 companies so far, which include Starbucks Philippines, DMCI Holdings and Hotel Sogo. The app currently has around 40,000 applicants. FindWork Philippines Country Head Rommel Torres said it aims to have 1:1 ratio of applicants and job postings in the next 12 months. To do that, it has inked partnerships with local government units of Makati City and Taguig City to hold small job fairs in their barangays. Torres said FindWork is also holding similar events in Cebu and Davao before the year ends. As well, graduates of the courses registered with the Technical Education and Skills Development Authority (TESDA), the government agency that regulates vocational schools and programs, are given easier access to set up accounts in the platform to help them land jobs easier after school. One of FindWork’s key features is its ability to match employers and employees based on their respective locations. For example, the first job postings that applicants see in the platform are those that are near their registered home addresses. Still, this does not mean that hirers and applicants cannot connect and match with those that are outside of their cities. “We just don’t want cities to have brain drain because we know that there are jobs available in each city. For example, in Taguig, they have a rule that half of the jobs there should be filled by those that live within the city. The same goes in Makati,” Torres added. Applicants are also regularly updated with the progress of their job applications in the platform as it provides notification if they are accepted, short-listed or rejected. FindWork claims this feature is a first among online local job marketplaces. But more than job recruitment, FindWork is looking to becoming a one-stop shop solutions platform for human resource practitioners. For one, the company is developing a payroll system that will enable employers to pay salaries without requiring employees to set up bank accounts, with the help of fintech firm TrueMoney. FindWork is also rolling out a feature that will allow HR personnel to do video interviews with applicants on top of text-based chats. It’s also planning to add an algorithm that will allow employers to authenticate applicants’ documents such as birth certificates and National Bureau of Investigation (NBI) clearances. The startup enters a field that is still relatively new and fragmented with few players such as JobStreet’s JobExpress, Hiring PH and ServeHappy.